Friday morning found my fellow author Joe Sonderman and I headed for Springfield, Illinois, for the International Mother Road Route 66 Festival. We planned to take our time driving up the older alignment, shunning the interstate for the day. To my delight, Joe decided to drive his '57 Chevy Bel Air and had spent a couple evenings polishing, putting on new tires, and all the other things one might do to a classic car before taking it out on the road. Lunch was great with good food and good service. Owners Karen Wiesemeyer and Coleman Weissman do a great job. From Hamel we headed north on Route 66 and from the Worden Wye we took the 1926-1930 alignment including the brick section north of Auburn. After arriving in Springfield, we got a few errands out of the way and then it was off to Capital City Shopping Center at Stevenson Drive and Dirksen Parkway (Bypass Route 66). Lineup for the cruise was already underway and more cars just kept coming. Some people had their lawn chairs out. Many had drinks and bags from the McDonalds next door. Most wove their way between cars to peruse the various models. We watched dozens of cars at a time coming in the several entrances - classics, dune buggies, a Radio Flyer, "Blues Brothers" police cruisers. Veterans of the event told us that there were "twice the cars" already there as at the same time last year. Maybe 1,000 cars total, we heard, would participate. Wow. We waited in a vast sea of automobiles as the late afternoon passed into evening. Police cars with lights flashing began to pull out of the lot a little after six. Finally, it was our turn - we were moving! The cruise route took us around the corner onto Stevenson Drive heading west. We were amazed at the number of people lined up along the route, many equipped with chairs and beverages for the evening. Car fans waved, smiled, and pointed out their favorites. At South Sixth Street our long stream of automobiles flowed north. Excitement was in the air and the crowds grew larger as we approached Springfield's downtown. The noise, the lights, the excitement, (the exhaust fumes) - amazing. The slow-moving vein of shiny vehicles circled the old courthouse square from Sixth onto Jefferson onto Fourth because of the closed-off streets for the festival. We parked, walked over to the Travel Illinois Expo space to check out our set-up for the next day, and then walked on down Sixth to find a good viewing spot. We had time to watch over an hour more of the cruise before it ended around 8:00 pm! 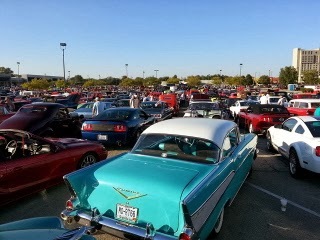 The next day, we heard the official number of participating cars: 2,250. Awesome event for this girl's first car cruise. Thanks, Springfield. Thanks, Joe.